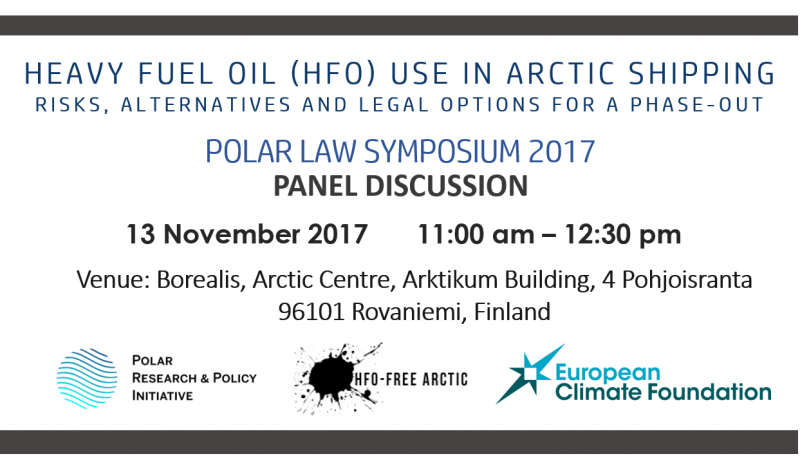 Polar Research and Policy Initiative and the Clean Arctic Alliance will be co-hosting a panel discussion on ‘Heavy Fuel Oil (HFO) Use in Arctic Shipping: Risks, Alternatives and Legal Options for a Phase-Out’ at the Polar Law Symposium 2017, supported by the European Climate Foundation. The event will be held at Borealis at the Arctic Centre (Arktikum Building) in Rovaniemi, Finland on 13 November 2017 from 11 am to 12:30 pm. You are most welcome to attend and can register for the Polar Law Symposium 2017 here. 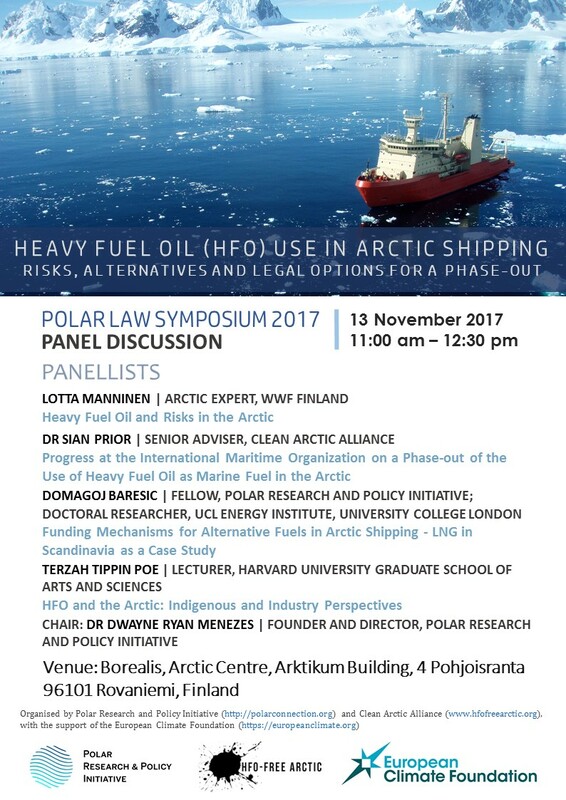 The aim of this panel is to bring together legal, policy and innovation stakeholders from key Arctic IMO member states and local communities to see what regulatory options could be developed and used to enforce a potential HFO ban in the Arctic and also promote the use of cleaner alternatives. The transport and use of HFO (Heavy fuel oil) in the Arctic, especially with respect to Arctic shipping has been identified as a major risk to human health and long term environmental sustainability of the Arctic. Currently, discussions are undergoing at the IMO to see whether consensus can be reached with respect to banning HFO in Arctic shipping, something that has already happened for Antarctic waters.